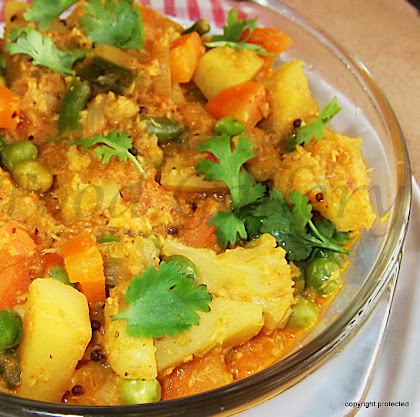 Vegetable Kurma/korma is a beautiful coconut-based curry from South India with a generous mix of vegetables. Its quite delicious & highly nutritive. Tastes awesome with rice, rotis, puris or parathas. Coriander leaves - To garnish. Chop the potatoes and carrots to fine cubes. Remove the ends and strings from the beans and cut them into 1-inch pieces. Chop the onions and tomatoes finely. Add the following items in a mixer and grind to a smooth paste - Coconut, ginger & garlic paste, turmeric, red chilli powder, a little water. Heat oil in a kadai and add mustard seeds. Once they start spluttering, add curry leaves. Add onion and saute till they turn light brown. Add the tomato and saute again till the tomatoes becomes mushy. Add the vegetables and mix well and cook them in low flame with a lid closed. Do not add water. Check if the vegetables are half cooked. Add the ground paste and mix well and fry in medium flame for about 4-5 minutes till the raw smell goes. Then add water (about a cup, but if you need more gravy then add half a cup more) and salt and let it cook in low flame. Check if the vegetables are cooked and add garam masala powder, and adjust salt if required and mix well and let it cook for another minute. Garnish with coriander leaves and remove from fire. Serve with roti, paratha or puri. Tastes good with rice too. You can boil the veggies and keep aside and add them at the end. In this case, fry the ground paste first properly and let it boil for a few minutes and then add the boiled veggies. If you want a greenish color to the kurma, add green chillies according to taste and a few coriander leaves while grinding the paste. Do not overcook the veggies. Yummy and healthy kurma,perfect with rotis. 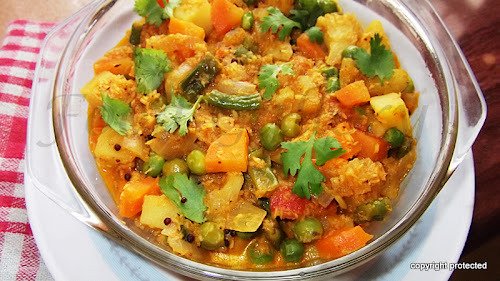 yummy and delicious kurma.U have a nice blog,u can visit my blog and give ur valuable comments. Just delicious!!!! The colors are beautiful and looks flavorful. I love the addition of coconut.